My First Time is a regular feature in which writers talk about virgin experiences in their writing and publishing careers, ranging from their first rejection to the moment of holding their first published book in their hands. 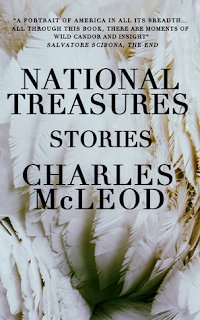 Today’s guest is Charles McLeod, author of the novel American Weather and a collection of stories, National Treasures. His third book, a prose hybrid entitled Asocliasm, Zemblanity, is forthcoming from University of Michigan Press in 2014. His fiction has appeared in publications including Alaska Quarterly Review, Conjunctions, CutBank, Eleven Eleven, Five Chapters, The Gettysburg Review, Hayden’s Ferry Review, The Iowa Review, Michigan Quarterly Review, The Pushcart Prize: Best of the Small Presses, and Fakes, an anthology edited by David Shields. He is the recipient of a Pushcart Prize and a Fiction Award from The Iowa Review, and has received fellowships from the University of Virginia, the Fine Arts Work Center in Provincetown and San Jose State University, where he was a Steinbeck Fellow. He is currently a Helen DeVitt Jones Fellow and AT&T Chancellor’s Fellow in the PhD Program in English at Texas Tech University. On a personal note, it's no secret I'm a fan of Charles' work and I include National Treasures among the finest books I've read this year (or any year of recent memory, for that matter). My first story acceptance came the summer after I’d finished my Master of Fine Arts program at the University of Virginia. A piece that had been rejected twenty-two times won a literary contest, a fact I found out while working a summer office job in Charlottesville and waiting to move to Provincetown for a fellowship at the Fine Arts Work Center. The subject line of the email was “Query,” but I knew the name of the sender, and had a pretty good guess at the email’s content. This was around eight years ago, in May, or maybe the first week of June. I turned thirty that year, in September, and went home to California to see my family. My dad, a smoker, had had three heart attacks over the course of his life, and was on a lot of medication, and used oxygen at night. The proofs of my story arrived at my parent’s address—my permanent address, one that no one I know lives at anymore—while I was back on the West Coast. I remember opening the envelope, which included a check, and showing the proofs and the check to my father. He was more impressed with the latter. I left a photocopy of the story on the counter in the kitchen, saying if he wanted to read it, he could. I flew back to the East Coast on the 5th, on my birthday. My dad died two days later. He’d gone in for a routine operation to have a vein removed from his leg. The night before, unbeknownst to him or anyone else, he’d had an embolism in his intestine, and was dying from sepsis, his own waste poisoning him. He went into a coma the next morning, and died while I was on a plane from Washington, DC to Detroit, trying to get back home. While I can’t know for sure if he ever read my story, my guess—an educated one—is that he did not. I stayed on the West Coast for two weeks after the funeral, trying to decide if I was going to take the fellowship I had been offered or not. Ultimately, I did. I spent my first few months on Cape Cod numb from shock and loss, and while I worked every day, and was happy to work, the rest of my time there was spent doing such exciting things as staring at walls and laying in bed until sunrise. I flew home for Christmas, and then flew back to Boston, taking a bus from Logan up to the Fine Arts Work Center. In an area next to the FAWC offices was a small room where we received our mail. It had a television, a sofa, and a tall, wide magazine rack that housed a variety of literary magazines. The copy of The Iowa Review that contained my story was among the titles. It was the first time I’d seen the issue. It was late at night, deep winter, and no one else was around, and if I’d felt my dad’s presence every second since his death, that presence was all the more pronounced as I stood there in the half-dark, staring at the magazine’s title. 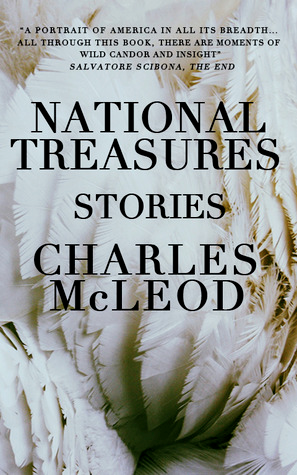 In that silence, the sidewalks outside ice-hided, I opened the magazine to the Table of Contents, and looked at my name, which is also my dad’s name—he was Charles McLeod, and I am, too. And for maybe a minute, I did nothing more—just held open the magazine to that page before returning the journal to its place on the shelf and picking up my duffel bag, and walking across a snow-covered lawn, and then up some stairs, to my temporary home. It's a wonder you didn't break apart, being tugged in opposing directions as you were, at such a fragile time. I see why David is such a fan of your writing.